Rubrobacter radiotolerans strain RSPS-4 is a slightly thermophilic actinobaterium isolated from a hot spring in central Portugal . Species of the genus Rubrobacter are extremely resistant to ionizing radiation [1-4]. The type strain of Rubrobacter radiotolerans P-1T (DSM 5868T, JCM 2153T) from Japan and strain RSPS-4 are two of the most resistant organisms to ionizing radiation, more so than the archetypal Deinococcus rediodurans strain R1 (DSM 20539T, JCM 16871T) . Both R. radiotolerans strains have a sigmoid shaped survival curve on a dose-response irradiation curve up to 25 kGy and a shoulder dose of 5.7 kGy, with a 37% survival of 7.6 and 9.0 for the type strain of R. radiotolerans and strain RSPS-4 . 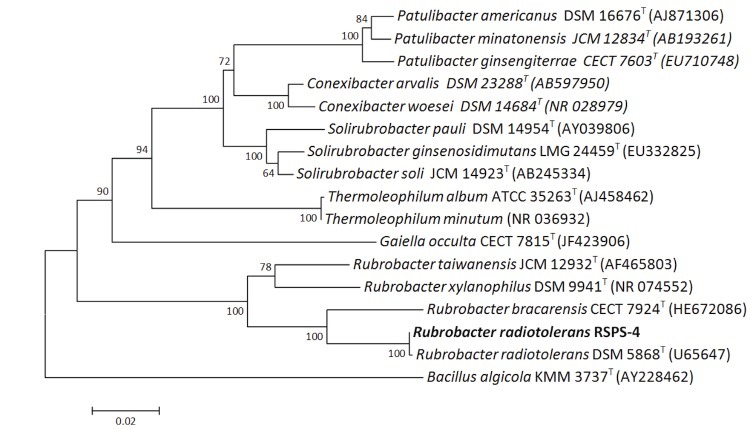 Deinococcus radiodurans has been the most studied bacterium for radiation resistance mechanisms [14-20], however, no single key factor has been identified to explain its resistance and it is now hypothesized that the ability to recover from high doses of irradiation results from a combination of several mechanisms. DNA repair systems were the first studied resistance mechanisms, but D. radiodurans contains a set of enzymatic repair systems similar to radiation-sensitive bacteria such as Shewanella oneidensis and Pseudomonas putida [15,21] and such systems are thus insufficient per se to justify the almost error-free reassembly of the irradiated D. radiodurans genome . Recent findings shifted the focus from DNA repair to antioxidant protein protection as a main resistance mechanism [15,23]. Several studies showed that irradiated cells maintained enzymes protected from oxidative stress and thus available for an efficient repair of DNA lesions [24-27]. The Rubrobacter radiotolerans strain RSPS-4 was isolated from a hot spring runoff at São Pedro do Sul, in central Portugal, after irradiation of the water sample with a cobalt-60 source at a dose of 8.06 kGy and a rate of 1.5kGyh-1 . The hot spring runoff had a temperature of 50ºC and a pH of 8.9. The strain grew optimally at 45ºC in medium containing no added NaCl but was able to grow in medium containing 6% NaCl (w/v), degraded hide powder azure, gelatine, hippurate, arbutin and esculin, was cytochrome oxidase, catalase and β-galactosidase positive and produced nitrite from nitrate. The fatty acid composition of RSPS-4 was dominated by the unique 12-methyl-16:0 (70% of the total) with lower amounts of 4-methyl-18:0 (15.7%-17.8% of the total fatty acids). The 16S rRNA gene sequence of strain RSPS-4 is similar to the sequence of the type strain of R. radiotolerans DSM 5868T , only differing in 2 positions. Classification and general features of Rubrobacter radiotolerans RSPS-4 are shown in Table 1. The strain was deposited at the Spanish Type Culture Collection (CETC) with the code CECT 8386. Rubrobacter radiotolerans strain RSPS-4 was grown on Thermus medium at 45ºC as described elsewhere . DNA isolation was performed from a 1g pellet of a 24h, exponential growth phase culture using the Wizard Genomic DNA Purification Kit (Promega, Madison, USA) following the standard protocol, without modifications, for genomic DNA isolation of Gram positive bacteria, as recommended by the manufacturer. The genome of strain RSPS-4 was sequenced in the GS20 sequencing platform (Roche -454 Life Sciences) at Roche Diagnostics GmbH, Penzberg, Germany. A total of 3 PicoTiterPlates generated 889,098 pyrosequencing reads with an average length of 106 bp. These were assembled into 70 contigs, with an N50 of 120,613, using the Newbler assembler (Roche). The Phred/Phrap/Consed software package [45,46] was used for sequence assembly and quality assessment in the subsequent finishing procedures. The gaps were closed by an Optimized Multiplex PCR approach , where 156 Sanger sequences were produced and added to the 454 reads to produce a hybrid assembly with Phrap. Together, 454 and Sanger sequences provided a 23× coverage of the genome. 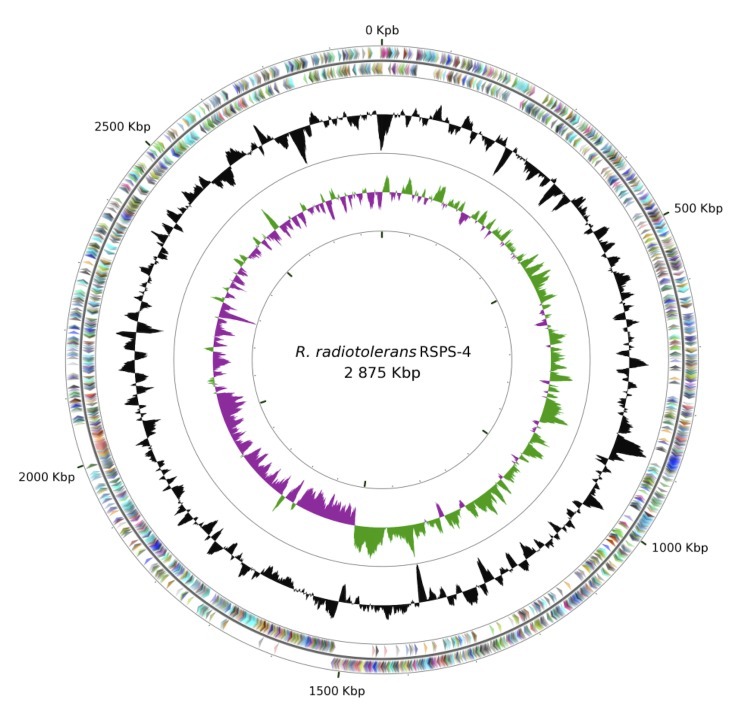 The genome sequence for Rubrobacter radiotolerans strain RSPS-4 was deposited at GenBank under the accession number XXXXXXX (Chromosome), XXXXXXX (Plasmid 1), XXXXXX (Plasmid 2) and XXXXXX (Plasmid 3). A particular feature of the RSPS-4 DNA repair pathways was the absence of the LexA autoprotease, the repressor that controls the expression of the SOS regulon in E. coli. The gene could not be identified in the RSPS-4 genome, based on a nucleotide sequence search using the two lexA genes described for the type strain DSM 5868T. Furthermore, the absence of this gene was validated by PCR amplification, using the genes of R. radiotolerans strain DSM 5868T as template to design specific lexA primers. The absence of this gene has been observed in bacteria from many genera, such as Mycoplasma, Chlamydia, Borrelia, Helicobacter, Coxiella, and the Cyanobacteria [71-73], and suggests alternative mechanisms to repair DNA damage in bacteria could be employed. In Lactococcus lactis, a LexA–independent SOS response is led by the HdiR protein . Moreover, other mechanisms may act alone or synergistically with the SOS response in DNA damage repair. In the radio-resistant D. radiodurans, the two LexA homologs undergo RecA-dependent cleavage after DNA damage, however, no regulon under the control of LexA1 or LexA2 proteins has been identified to date . In this organism, recA induction following gamma irradiation is not controlled by LexA1 or LexA2 but depends on a Deinococcus specific regulatory protein IrrE, also designated PprI, a positive effector that enhances the expression of some DNA repair genes following exposure to radiation . Reactive oxygen species (ROS) including hydrogen peroxide, superoxide and hydroxyl radicals are toxic to cells due to their ability to damage DNA and specially proteins containing iron-sulfur clusters or sculpture atoms. In order to prevent the damage induced by ROS, cells have several mechanisms of response to oxidative stress. Strain RSPS-4 has a single gene for a manganese containing catalase (RradSPS_2184), whilst katA, katE and katG were not detected [15,78]. Superoxide dismutase was also encoded as a single gene identified as sodA (RradSPS_0327), and was also dependent on manganese . Peroxiredoxins, which reduce H2O2 to water, were encoded by six copies of alkyl hydroperoxide reductase subunit C/ Thiol specific antioxidant (AhpC/TSA) (RradSPS_0148, _0515,_ 988, _1124, _2530, _2650) while peroxidases such as BsaA were not detected. A single gene for thioredoxin reductase trxR (RradSPS_0074)  was detected in the genome, as well as a gene for the trxA (RradSPS_0519) and two for grxA redoxins (RradSPS_1230 and _3087), involved in redox balance . A single gene for thiosulfate transferase (RradSPS_0885)  was also found in the genome. Although regulatory genes of the oxyR family were not detected, lysR (RradSPS_1021, _1060, _1715, _1856 and _2024), which activates the transcription of genes involved in peroxide metabolism and protection in D. radiodurans (katG, ahpC, ahpF, and dps) were detected . Apart from the proteins related to mobile elements, the two additional segments present in the type strain have several transcriptional regulators (Table S2 and S3). LexA was present in two copies, one in the chromosomal segment (Rrad_2461) and the other in plasmid 1 (Rrad_3065). The location of this gene within a mobile region may explain its absence from the RSPS-4 strain. Other transcriptional regulators were identified in these genome segments; the transcriptional regulator of the XRE family (Rrad_2455 and _3061), which acts as a repressor–like protein of several phages , ArsR (Rrad_2469), which participates in the stress response to heavy metals  and LuxR (Rrad_2505 and _2856) and TetR (Rrad_2866 and _2871), which are involved in diverse pathways such as those encoding virulence factors and antibiotics biosynthesis , the control of multidrug efflux pumps, and the response to osmotic stress or toxic chemicals . The extra segments present in DSM 5868T genome were populated by hypothetical or conserved hypothetical genes, 32 in the chromosome 1, and 29 in plasmid 1 (Table S2 and S3). The segments additionally encoded transporters involved in heavy metal homeostasis (such as heavy metal translocating P-type ATPase, (Rrad_2468)), proteins involved in lipid biosynthesis (such as 4'-phosphopantetheinyl transferase), proteins involved in the type II/III secretion system (Rrad_2515, _2516 and _2853) and several enzymes involved in the respiratory chain (Rrad_2470-2477) (Table S2). Most genes in the extra segments of type strain were actually also encoded in other regions of the genome, suggesting that the duplication of certain genes may provide the DSM 5868T strain with increased ability to respond to stress conditions. Battista JR, Rainey FA. The genus Deinococcus In: Bergey’s Manual of Systematic Bacteriology (Boone, D.R. and Castenholz, R.W, Eds).Vol 1. 2nd ed. New york: Springer; 2001:369–403. Attwood TK, Coletta A, Muirhead G, et al. The PRINTS database: a fine-grained protein sequence annotation and analysis resource--its status in 2012. Database J. Biol. Databases Curation 2012;2012:bas019. Basu B, Apte SK. Gamma Radiation-induced Proteome of Deinococcus radiodurans Primarily Targets DNA Repair and Oxidative Stress Alleviation. Mol Cell Proteomics 2012; 11:M111.011734.